Charvet is a French high-end shirt maker and tailor located at 28 place Vendï¿½me in Paris. It designs, produces and sells bespoke and ready-to-wear shirts, neckties, blouses, pajamas and suits, in the Paris store and internationally through luxury retailers. Its exceptionally long history is associated with many famous customers, some of them infatuated with the brand, and writers have often expressed their characters' identity through references to Charvet. Historic shirt shop in Paris. In 1838 Cristophe Charvet opened a shop on Rue de Richelieu where he took measurements and offered fabrics. Shirts were cut and sewn in the back. It was the first shop of its kind. His shirts were known for their high quality of fabric, care in manufacture, and the elegance of the finished product. In 1839, Charvet already had some followers, but still the "best supply". The same year, Charvet held the title of official shirtmaker to the Jockey Club, a very exclusive Parisian circle, then headed by prince Napolï¿½on Joseph Ney and inspired by count Alfred d'Orsay, a famous French dandy. It had about 250 members, mostly aristocrats, who, despite the name of their club, were more interested in elegance than horses. Being a member was a necessary step in order to become a lion, the term used then for a dandy. In an advertisement of March 1839, Charvet, presenting himself as the Club's shirtmaker, claimed to offer "elegance, perfection, moderate prices". Soon after, the claim to moderate prices was dropped. Joseph-ï¿½douard Charvet, known as ï¿½douard Charvet, (1842ï¿½1928) succeeded his father Christofle in 1868. He in turn was joined in the early 20th century by his three sons, ï¿½tienne, Raymond and Paul. The store was initially located on the rue de Richelieu. It moved to number 25, place Vendï¿½me in 1877. This move reflected a shift in the center of the Parisian high society and the growing importance of the palais Garnier against the Thï¿½ï¿½tre Italien, closer to Charvet's original location. Though Charvet began to offer women's blouses and men's suits in its new store, men's shirts remained the house's specialty. 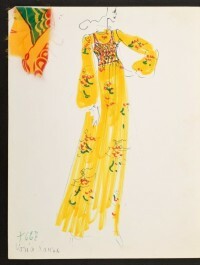 An American journalist, visiting the store in 1909, reported "there were shirts of every variety and almost every color, artistic enough to make one long for them all, and each and every one most beautifully made." The store was noted for its displays and Charvet paid an "immense salary" to the window decorator, who displayed "each day a new series", producing "veritable works of art in his harmonious combinations of scarves and handkerchiefs and hosiery". In 1921, the store moved to number 8, place Vendï¿½me. In 1982, it moved to its current location, at number 28. 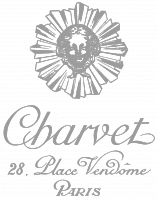 Charvet remains the oldest shop on place Vendï¿½me, which explains both the inclusion of the location into the firm's name, and the use as a logo of the sun device ornating the balconies of the Place, which was built in honor of Louis XIV, the Sun King. When in 1965 the Charvet heirs sought to sell the firm, they were contacted by an American buyer. The French government, knowing Charvet had been for a long time General de Gaulle's shirtmaker, grew concerned. The French Ministry of Industry instructed Denis Colban, Charvet's main supplier, to locate a French buyer. Rather than approaching investors he decided to purchase the company himself. Until then, Charvet was operated in much the same way as it had been since its foundation: a customer was shown only what he requested, in most cases something fairly conservative. After Mr. Colban bought the firm, things changed. The change started when Baron Rothschild came into the store and asked to see some shirting fabrics, one of which was pink. When M. Colban, following previous Charvet practice, advised against the color, the Baron retorted, "If not for me, who is it for?" Some time later, Nelson Rockefeller requested some shirt swatches be sent to New York. Bold stripes and unusual colors were sent and eventually selected. Colban had changed Charvet's policies as well as its role in the design process with the customer. A wide range of products was put on display, transforming the store in a "veritable casbah" of colors and fabrics. Colban also brought significant changes to the aspect of the store, having all the venerable furniture varnished in black. He created new lines of products and started ready-to-wear finely made shirts for men and women. A few years after, he was one of the first of many famous European shops and designers to sell ready-to-wear shirts, ties and accessories to Bergdorf Goodman. However, even while developing these new pre-made lines of products, Colban always insisted on the bespoke aspect of the firm as its core identity. He emphasised that "the essential hardest of all to accomplish in today's world of quick and easy pseudo solutions, is an atmosphere of 'yes' to the customer and, even more, a respect for that commitment", re-iterating the focus of Charvet on its bespoke business. Today Charvet is one of the five most prominent French shirtmakers of the 20th centuryï¿½Bouvin, Charvet, Poirier, Seelio, and Seymousï¿½all but Charvet have closed their doors. It is also the only remaining shirtmaker on Place Vendï¿½me. The goal of the company is to give its customers the option to custom order or customize everything it sells, from neckwear to underwear. Bolts of fabric on display throughout the store can be held against oneself to see how they really look. Charvet creates exclusive fabrics for all its collections and prides itself of going a long way to satisfy customers, remaking on request ties purchased years earlier or changing a shirt's frayed collar and cuffs.